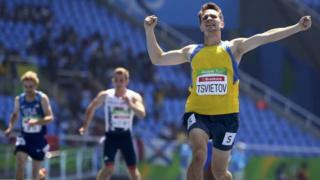 Ukraine's Paralympic success: What's the secret? When it comes to the Olympics and Paralympics, China, the US, Russia and Britain (these days) are usually to be found near the top of both medal tables. But there is one country that, while producing its worst ever performance at the Rio Olympics last month, becomes a world superpower once the Paralympics start - Ukraine. Sixth in Athens in 2004, they finished fourth at both Beijing 2008 and London 2012. Now they are poised to go one better, sitting a comfortable third in the medal table in Rio. But the Rio performance is particularly astonishing given the country's recent history, with an economic crisis, war in the east and the loss of their main training centre in Crimea after the region was taken over by Russia. The country's President, Petro Poroshenko, has described the performance of the Ukrainian Paralympians as "incredible", adding that the athletes prove "that the impossible is possible". Image caption Valeriy Sushkevych says Ukraine has the "best system of sport and rehabilitation"
Ukraine's own Paralympic chief, Valeriy Sushkevych, is the man credited with much of the success, in particular a programme he developed called Invasport. Invasport works by having schools and facilities dedicated to Paralympic sports in every oblast (region) of Ukraine. "In Ukraine we have set up the best system of physical education, sport and rehabilitation for people with disability," Mr Sushkevych told the BBC. "There is infrastructure in all regions of Ukraine, with schools for children with disabilities. This system works and brings results. "But the system can't work without people… people who withstand all these problems: lack of money, political crisis, war and all other troubles. And these people are extremely dedicated." Mr Sushkevych, who himself had polio as a child and who has spent most of his life using a wheelchair for mobility, says the system emphasises rehabilitation for all disabled children who enter it - but promises much more for those who appear promising at sport. "We invite people for rehabilitation, and amongst those 100 who come, we find maybe five who are good at swimming, or football or athletics," he explains. "We have to give them opportunity to realise their own potential." The way that Invasport works means that facilities and recruitment are spread out through the country, rather than concentrated in one area. As Mr Sushkevych told the BBC, this meant that Ukraine's Paralympians were able to come even when the main training base, the Yevpatoria facility in Crimea, was taken over by Russia in 2014. "We had to find other options for athletes to train - and I have to say that those were not the best conditions," he said. "But we had to adjust to those conditions, and even had to train in old post-Soviet facilities. Experience, knowledge and huge professionalism of the team made this result possible." The pay-off has been an extraordinary 72 medals at the time of writing - some 42 of which are in the pool. Powerlifter Lidiya Solovyova, who has won a gold medal, says that her main motivation to succeed is the fact that Ukraine does not offer many opportunities to people with disabilities outside of sport. For many, it is quite literally sink or swim. "This is my main job," she explains. "In our country it is very difficult to find a job for people with disability... Paralympic sport is my main income. I live off it." After the loss of the Yevpatoria camp, she has been training at her hotel - which she acknowledges may have affected some of her teammates and prevented them from achieving even more. "The camp was specifically designed for athletes with disability, all facilities," says Solovyova, who has dwarfism. "!We felt like home over there and at the hotel we were like guests. For me it was OK, I don't know about others." Mr Sushkevych says he agrees that - not least because of the war - the level of preparation was "not the highest possible". "The world sees the successful side of my team, what has been achieved - but no-one sees what has not been achieved," he says. "I can definitely tell you that we could have performed better if there was no war in Ukraine. And the aim for my whole team in the Ukrainian Paralympics movement is to show the best possible as it is so important for my country."